Getting only four hours sleep last night was not very good for me, but I managed somehow. But I did end up missing all of the morning programming I'd intended to attend. I did however attend a session designed to jump-start a discussion of the "Fannish Inquisition" of bidders and seated conventions at SMOFCon. Despite the Inquisition on Saturday night lasting 2 1/2 hours, there apparently was at least one person complaining that it wasn't long enough, and that the Probability & Statistics Seminar was being used to hurt the Inquisition or something like that. Presumably that person thinks we should have stayed in that overheated ballroom until 2 AM or something. And Ghod Forbid that people might want to leave the Inquisition to start eating the ice cream provided by one of the bids; that's has nothing to do with convention running either. I did get to the Feedback session, which was mostly positive. 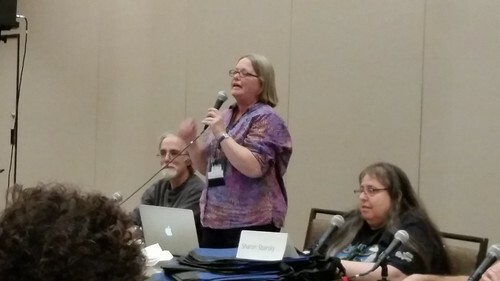 Chair Laurie Mann reported that 210 people attended SMOFCon 35. (Oh, and incidentally that means about 12% of the members wanted to play in the tournament). 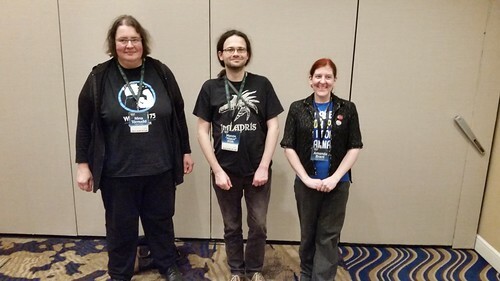 After the convention officially ended, I got this photo of CanSMOF scholarship recipients Nina Törnudd of Helsinki, Finland, Marcin Klak of Krakow, Poland, and Amanda Brant of Winnipeg MB. CanSMOF, the parent non-profit corporation behind the 2009 Worldcon in Montreal, has for some years now sponsored scholarships to bring fans to SMOFCon. All three recipients said they had a good time and learned things. I'm on the Board of Directors of CanSMOF and also was on the scholarship selection committee, so I'm glad this seems to have worked out well. After closing, I went out to dinner with a group of SMOFS (of course) to The Salty Pig restaurant near Copley Place, not too far from the hotel. They had excellent smoked meats and cheese (sort of like Barcelona) and Italian food. I enjoyed it, but I was still hungry, so as we walked back through the mall to the hotel I bought some nice sugar-free chocolates. I'm glad I did not buy more than I did, because I probably would have made myself sick if I'd tried to eat more than that when we got back to the con suite. I hung around for several hours talking with people before deciding that I did need to pack and get ready to get some sleep. My flight tomorrow (which alas appears to be packed to the rafters) is at about 10:30 AM, so it's not quite as dire as the trip out. However, unless I can figure out a way to repackage the case of poker chips in such a way that I can treat it as a second piece of checked luggage (rather than as part of my first checked bag), it's going to cost me an extra $100 (rather than $35) to get it home because even after taking out my CPAP and other items, my first checked bag is going to end up weighing between 50 and 70 pounds. SMOFCon is a fairly intense experience. I enjoy it a great deal. 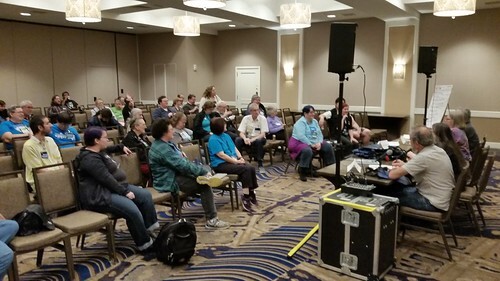 Many of my friends and colleagues in SF/F convention running attend, and I get to socialize far more than I can at Worldcon, because most of us are so busy with working on the convention itself. However, I seem to get more exhausted with SMOFCon's three days than Worldcon's five sometimes. Santa Rosa next year might be a little easier because it won't be such a long way to travel.